Reflections one month after the burn: Burning Man is a gigantic playground to embrace the Third Metric of success: Wisdom, Wonder, Well-being, and Giving. Henry V. Bao, Community Architect. Product Strategist. Burning Man operates on a "Gifting" economy since there is no money involved. Participants create a new society together, and give generously to one another. Every year, 70,000 participants flock to Black Rock Desert in Nevada to build a temporary metropolis and society. For a week, we’d bring everything we need, eager to take part as citizens in this magical community. Started as a bonfire ritual at Baker Beach in San Francisco in 1986 with a symbolic burning of a large wooden effigy (“the Man”), Burning Man is now a global movement in community, art, and self-expression, a celebration of life sans pareil. 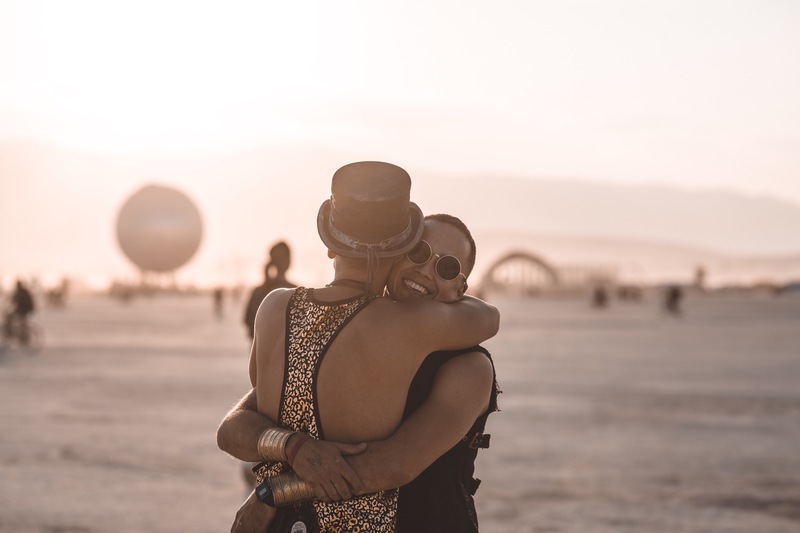 Burning Man represents a gigantic playground to fully embrace elements of a life well-lived according to the Third Metric of success in Arianna Huffington’s best-seller Thrive: Well-being, Wonder, Wisdom, and Giving. When we die, our eulogies celebrate our lives very differently from the way society defines success. It’s easy to let work take over and forget the relationships and things that truly sustain us. After the burn this year, I officially launched 10 NEXUS, a membership that offers space for meaningful conversations and connections to unfold in real life, where we can talk about what matters most. This year, we re-entered Black Rock Desert, eager to explore and play in this giant sandbox like wide-eyed children again for a week. “Welcome home!,” the dusty lady who checked our ticket at the gate yelled. As a technologist who truly values time to get unplugged, I look forward to turning off all notifications for the whole burn week every year. There is no other place on Earth I feel more connected, human and alive. Happiness and true enjoyment come from living in the present moment. We’d roam around on our bike, more often than not without a set destination. Biking under the 100-plus-degree scorching desert sun, I marveled at every other art sculpture out there on the “playa”. The art theme this year, “I, Robot”, was a play on the many forms of artificial intelligence that permeate our lives. The playa, means “beach” in Spanish, refers to the majestic open space that enclosed our utopian “city”, a metropolis shaped like a giant fan. My childhood dream came true. I was wandering around one morning near the famed art car Robo Heart at sunrise and found this bat-mobile in the middle of the “playa”. There is something quite special and beautiful about that magical serendipity on the playa. We bump into people we want to see without planning to. We meet strangers who became friends. Whatever we look for just magically appears. “The playa always provides,” we’d say. 2) We can create anything we imagine. As we were biking, a dust storm or occasional “white-out” would wipe out our entire vision. And yet there was sensory overload, a sort of constant stimulation that keeps us hooked on everything we see: acrobats performing gymnastic feats on a swing, colorful costumes that play to this year’s theme “I, Robot”, the smell of grilled chicken a nearby camp is giving out, music coming from all possible directions. Burners admiring a surrealistic art piece at dusk. A whole new world was built within a week. A new society emerged with its own set of rules. In this world, we can freely choose and act, limited only by the capacity of our imagination. This empowering lesson reminds us: we can create our own reality; every day is a blank canvas, to be drawn and colored however we want to. If we are lucky, we have about 30,000 days to play the game of life. So let’s wake up every morning excited about our life, grab that paintbrush, and use all the colors and brushes to bring to life what we envision for ourselves and others. After a week, we pack up and leave Black Rock City with nothing left behind, not unlike the impermanent nature of all things. “Leave no trace” is one of Burning Man’s 10 key principles. In the end, everything at Black Rock City returns to dust. Life is ultimately very short, and everything we do counts. We should strive to enjoy every moment as much as we can. Burners admiring an art piece at dusk, the “Golden Hour” because of how magical the skyline appears. All art sculptures and camps are taken away after the burn, leaving no trace behind. In this de-commodified society, gifting becomes the norm. There is no money at Burning Man. And no, it does not run on a “barter” system. Instead, we experience the generosity and kindness of others. “Gifting”, “communal effort” and “participation” are three of the 10 key principles at Burning Man. I was biking around one day, and within the span of a few hours, had bacon and eggs for breakfast, a massage and steam bath to decompress after a crazy night out that ended on the art car Robo Heart, attended workshops on energy healing and “how to design the future”, all provided for and by citizens of Black Rock City. Amid the scorching desert heat and freezing cold, these authentic human connections keep us warm and alive. It is easy to get lost; we sometimes experience the kindness and generosity of strangers who invite us in for a cup of tea, some food, or simply a much needed long embrace. Burners would hug one another even when they first meet. Gifting is the norm. Amid the scorching desert heat and freezing cold, these authentic human connections keep us warm and alive. A key element in the Third Metric of success has always been the willingness to give of ourselves, prompted by empathy and compassion. Burning Man gives us an opportunity to redefine and completely create a new society we want to live in, one where we are kind, generous and empathetic to one another. The Temple has always held cosmological importance in Black Rock City and our shared Burning Man culture. It is a special place for healing, sharing emotional experiences, and connecting deeply with one’s own self and other burners. The temple burns on Sunday night. The Temple, a beautiful swirling structure named Galaxia this year, has a kind of magnetic energy that grips us the moment we walk inside and leaves us in utter awe. It reflects “the mad masquerade and joy of our community” but with “sacredness, solemnity, a sense of remembrance, grief, and renewal” (Burning Man, Building the Temple). The symbolic burning ritual means different things for Burning Man participants. For me, this year’s burn signifies the death of several old relationships. I went to the Temple earlier in the week to write letters and put down objects of remembrance. A solemn mood enveloped the Temple: folks were chanting and sitting in silence in honor of the departed. What pearl of wisdom! Once a year, participants look forward to this symbolic burning ritual as a fresh new start, ready to take on new bold endeavors for the year. At Burning Man, every sunrise and sunset becomes a celebrated phenomenon, a festival of its own. We’d count down, clap and cheer triumphantly as the sun rises, and howl collectively (yes, howl!) at the exact moment the sun goes down. We dance to music late into the night to celebrate life. Every single day is quite literally a cause for celebration. On Thursday around dusk, a magical time at Burning Man, I attended a wedding at Camp Mystic. Pictured: Tim Ferriss, author of “The 4-Hour Workweek” and famed podcaster, speaking at the wedding. How can we bring the same sense of wonder and gratitude into our daily lives: to wake up every day – fully charged and invigorated to do what makes us come alive most, to keep pressing on – even when the going gets tough? I found the “ten finger gratitude exercises” by Oxford clinical psychologist Mark Williams to do wonders. In this daily exercise, you list 10 things you are grateful for and count them out on your fingers. Gratitude is proven to lower stress, and give us a greater sense of calm, empathy and compassion toward others. I recently discovered the 6-Phase Meditation by MindValley, which covers gratitude, forgiveness and powerful visualization techniques, all in 15 minutes. Having tried many forms of meditation for years, I found this to be a very effective way to start the day. I started to integrate moments of mindfulness into my daily life. I’d take the East River ferry to work instead of the subway in order to enjoy the Manhattan skyline (to my surprise, the ferry is just as fast, if not faster sometimes). Fall is my favorite season to enjoy long, meditative walks in New York. I started to take more trips upstate to Hudson Valley just to revel in the beautiful autumn foliage. Burning Man is the perfect place for contemplation. Pictured: Man standing on an art sculpture against the Temple and mountains in the background. Arianna Huffington affirmed in Thrive: when we die, our eulogies celebrate our lives very differently from the way society defines success. It’s easy to let work take over and to forget the relationships and things that truly sustain us. “It’s easy, in effect, to miss the real point of our lives even as we’re living them”. – Arianna Huffington. After the burn this year, I launched 10 NEXUS, a membership that offers space for meaningful conversations and connections to happen in real life, where we can talk about what matters most in our life. Drop me a line here or on LinkedIn if you enjoy the piece, or want to join a conversation at our next 10 NEXUS dinner salon in New York or San Francisco. Henry V. Bao is a mentor at Thinkful, and works with leading startups on product and growth engineering initiatives. He is also the founder and Chief Question Asker at 10 NEXUS, a membership that offers space for meaningful conversations on what matters most in our life. Bao writes about technology, mindfulness, community building, and the future of how we live and work. He splits his time between New York and California.